An exceptional Chinese mushroom that has long been highly regarded in traditional Chinese medicine. Used in the treatment of a variety of disorders. Promotes health and longevity and boosts the immune system. It is believed to promote health and longevity and to be one of the best boosters of the body's immunity against diseases. Reishi contains Germanium and is considered to have a powerful effect against tumors and cancers. Recent research has found Reishi to be beneficial in relieving fatigue and stress, treating viral infections and joint inflammations, lowering high cholesterol and triglycerides, reducing heart disease symptoms, regenerating the liver, alleviating allergies, calming the nervous system and helping with the treatment of diabetes. Very occasionally, with continuous use over three to six months, some may experience dizziness, dry mouth and throat, nosebleeds, and abdominal upset. However, studies in Asia indicate that Reishi is a supreme health food supplement that has virtually no toxicity or side effects and is safe for long-term use. As it may potentate anticoagulant drugs Reishi is not recommended if taking an anticoagulant (blood-thinning) medication. Adults & Children Over 10 Years: 1 capsule twice daily. Children (5 to 10 Years): 1 capsule daily. Reishi has been classed as the highest value healing herb in China for thousands of years. Increases disease resistance and normalises bodily functions. An excellent tonic as part of any healing program. Beneficial for healing the nervous system and for fatigue, including CFS & M.E. Potent anti-allergy effects. Excellent for treating bronchitis and asthma, also see Asthma and Bronchitis Herbal Formula. Aids liver function and circulation. A broad acting remedy, it can be taken on a long-term basis. The Reishi Mushroom grows on old, broad leaf trees and often attains a weight of over one pound. Reishi has been used in traditional Chinese medicine for more than 4,000 years and was highly prized as an elixir of immortality. In China it is known as Ling Zhi and is often called "the marvellous herb", it is classified as "superior" and fits into a category called Fu-Zheng. According to Fu-Zheng, the primary function of the Reishi Mushroom is to increase disease resistance, normalise bodily functions. It is also seen as a natural remedy for fatigue and weakness, asthma, insomnia, and cough. Today, through scientific research, we are able to understand why the Reishi Mushroom has achieved its tremendous reputation as an enhancer of immune function. It is now being classified by scientists as a "Host Defense Potentator". The University of Texas Science Centre in San Antonio studied its anti-inflammatory properties, concluding that it is comparable to hydrocortisone and aspirin – with the ability to reduce inflammation when taken orally and applied directly to the skin. The polysaccharides and triterpenoids in Reishi Mushrooms enhance the functioning of the immune system. In laboratory studies, these polysaccharides suppressed the growth of implanted tumour cells. Reishi Mushrooms have been shown to reduce lipids and cholesterol in the blood. It is a stress-reducing herb effective in treating conditions such as stomach ulcers and high blood pressure. Reishi is a wonderful herb (or functional food) for the nervous system. Indications include insomnia, anxiety or nervousness accompanied by general adrenal weakness or general neurasthenia or deficiency symptoms. In people suffering from insomnia, it enhances the relaxation increases sleeping time. It is especially suitable for the sensitive patient - normally difficult to treat, as remedies tend to over stimulate. This also applies to those with chronic fatigue and ME. We consider it a remedy of first choice along with Zell Immunocomplex and a re-mineralisation programme. The Institute for Appropriate Technology reports that laboratory trials have confirmed that ganoderms such as Reishi Mushroom are effective in combating viral and bacterial infections by stimulating the production of Interleukin 2 in the bloodstream. Reishi is now being used in the treatment of AIDS. Christopher Hobbs L.Ac. A.H.G. wrote in Herbs for Health Magazine that recent test-tube and human studies have demonstrated anti-allergic, anti-inflammatory, antibacterial, and antioxidant effects. 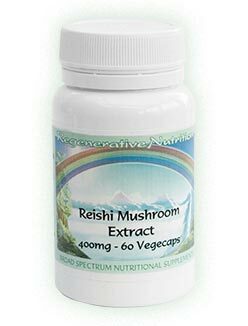 When more than 2,000 patients with chronic bronchitis were given Reishi Mushroom Extract in tablet form, 60 to 90 percent of these patients showed a marked improvement in health, including increased appetite, within two weeks. Mushrooms are regarded as by the Chinese as "spirit medicine' because they nourish the ‘shen’, or spirit. They are considered particularly important in vegetarian diets and regarded as a medicinal food that promotes longevity. One of the oldest recorded botanical monographs has claimed that Reishi mushroom made the body lighter, which may refer to its ability to reduce cholesterol and blood lipid levels. In the first Chinese herbal text (Shennong’s Pharmacopeia) written about 2400 years ago, Reishi was classified as a "superior herb". That ancient book said, Reishi was traditionally called "the mushroom of immortality." The Reishi Mushroom grows wild only upon old trees and roots of certain types of trees in remote mountain forests of China, Japan and Korea. Only in the last fifteen years have we seen the cultivation of Reishi, and thus the commercial availability of this amazing health product. Reishi has been the object of intensive scientific studies to discern its many health functions from a modern perspective. It is believed to be a tonic to all of the body's energies and was revered as a major tonic to the three Treasures, Jing, Qi and Shen. As a Jing (Essence) tonic, Reishi is believed to have major life lengthening effects when consumed over a long period of time - builds primal power and to replenishes energy spent handling stressful situations. As a Qi tonic, Reishi is used to build energy, although it is slightly sedative in the short run. It is most famous as an herb used to build the immune system. Studies in Japan have shown Reishi to have a powerful effect on the body’s overall resistance to disease. Japanese and Chinese researchers believe it has a regulatory effect on the immune system, bringing up immune functions in cases of immunodeficiency and reducing the excesses associated with auto-immune conditions. As a Shen tonic, nothing compares to Reishi. It is believed to protect the Spirit and to nurture the growth of intelligence, wisdom and spiritual insight. Reishi is a superb anti-stress herb; everyone who takes Reishi notices the peacefulness that seems to accompany its use. Many are able to stop using chemical drugs. The healing effects are cumulative, gradually strengthening the nerves and actually changing how we perceive life. Reishi mushroom, also known by its formal name of Ganodera and its Chinese name Ling zhi, has attained an unparalleled reputation in the Orient as the ultimate herbal substance. For over 3,000 years it has been the most sought-after product of nature by the emperors and empresses of all Eastern nations. It has routinely been used by mountain hermits, monks, Daoist adepts and spiritual seekers throughout Asia to calm the mind, ease tension, strengthen the nerves, improve memory, sharpen concentration and focus, build will power and, as a result, help build wisdom. These seekers called it the "Mushroom of Spiritual Potency". The people of Asia believe more than ever in Reishi's power to improve the quality of life by improving the inner life of a human being. The scientific validation only explains the physical nature of Reishi, but it is the profound ability of Reishi to improve one's life on every plane that makes it so incredible. In Chinese medicine, addiction is seen as a form of disturbed Shen. Humans have the capacity to become dependant upon certain activities, modes of thinking or behavior. For at least two millenia, herbal medicine has been used to overcome dependancy; and one of the most popular herbs for this purpose is Reishi Mushroom due to it's adaptogenic and Shen developing qualities. Reishi is a superb tonic for people who suffer from chronic allergies and is believed to have major benefits on the lungs and liver. Studies in Japan have shown that Reishi protects the liver from damage due to toxic chemicals, including pharmaceutical metabolites. Further studies in Japan and elsewhere have demonstrated that Reishi is beneficial to the cardiovascular system; it appears to help regulate coronary and cerebral blood flow and also seems to help reduce levels of blood lipids and in lowering elevated cholesterol. Patients with coronary heart disease and hyperlipidemia have experienced improvements in symptoms such as palpitations, dyspnea, pericardial pain, and edema (Chang & But, 1986). In one controlled study, a reishi extract showed the ability to reduce blood viscosity and plasma viscosity in hypertensive patients with hyperbpidemia, some of whom were recovering from an episode of cerebral thrombosis (Cheng et all). In another study, Reishi extracts were reported to reduce blood cholesterol and lower blood pressure (Kanmatsuse et all 1985). Reishi is said to act as a cardio-tonic and has been used to treat arrhythmia (Ding, 1987). Another key action of Reishi is found in its anti-allergic effects. In the last 20 years, G. liicidinn has undergone a number of clinical studies with humans and is thought to be beneficial for a wide variety of disorders, including: neurasthenia, dizziness, insomnia, rhinitis, and duodenal ulcers (Ying et al, 1987); liver pain (hepatodvnia), symptoms associated with anorexia, maldeveloped brain, retinal pigmentary degeneration, leukopenia, progressive muscular dystrophy, liver failure, hyperlipidemia, and diabetes (Tamura et al.1987a.b,c,d,e). The clinical effectiveness of ling zhi extract and its components in this wide range of disorders is currently being used in clinics and tested extensively throughout Asia and other parts of the world. Reishi has shown favorable results in treating hepatitis, especially in cases without severe impairment of liver function (Chang & But, 1986). In a study of 355 cases of hepatitis B treated with Wulingdan Pill, which includes the fruiting body of Reishi, 92.4% of the patients had positive results (Van et al, 1987). In a clinical report from the MARA Institute of Technology, positive results were also seen in patients with diabetes, acute myeloid leukemia (AML), and recurrent nasopharyngeal carcinomas. Of special note are Reishi's action on the lungs and heart. In clinical studies conducted in China during the 1970s, over 2000 patients with chronic bronchitis were given a tablet form of Reishi syrup. Within 2 weeks, 60-90% of the patients showed marked improvement, including increased appetite. The older patients, especially, seemed to benefit the most, and those with bronchial asthma, in particular, responded well (Chang & But, 1986). Reishi contains several constituents, including sterols, coumarin, mannitol, polysaccharides, and triterpenoids called ganoderic acids. Ganoderic acids seem to help lower blood pressure as well as decrease low-density lipoprotein (LDL) and triglyceride levels. These specific triterpenoids also help to reduce blood platelets from sticking together - an important factor in lowering the risk for coronary artery disease. As it may potentate anticoagulant drugs Reishi is not recommended if taking anticoagulant (e.g., blood-thinning) medications, it is recommended that you will most likely need a lower dose of your anti-coagulant drugs, if taking Reishi, so your blood viscosity should be checked and adjustments made accordingly. Many nutritional substances including Reishi have a normalising effect on the blood. So if your blood platelets are sticky and clump together you are in an unhealthy condition, and in this situation blood thinning medication is used, although it is the practice to prescribe blood thinning medications routinely for High Blood Pressure, even though the viscosity of the blood has not been checked. In animal experiments, Reishi extracts have shown a very low toxicity. (Chang & But, 1986). There is little reported data on the long-term adverse effects of Reishi and its derivatives. Slight anti-ulcer activity, perhaps due to the central depressant effect (Kasahara and Hikino, 1987).